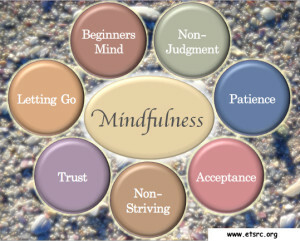 Non-judging: Mindfulness is cultivated by assuming a stance of non-judging witness to our own experience. This requires that we become aware of the constant stream of evaluative and judging thoughts that we have—then try to step back. With a non-judging mind, things are neither “good” nor “bad”—but simply present or absent. Patience: Patience demonstrates that we understand and accept that things have their own time for unfolding. We tend to be impatient with ourselves, expecting we “should” be able to calm the mind, stop the thoughts, or get over whatever is upsetting us. These things have their own schedule and patience allows us to simply observe the unfolding of the mind and body over time. Beginner’s Mind: In order to be able to see the richness of the present moment, it helps to cultivate a mind that is willing to see everything as if for the very first time. With beginner’s mind, the joys of the world as it unfolds around us become new again, as if we are all children—freed from our old expectations based on past experiences. Trust: You are your own best guide. This is true. It is far better to trust your own feelings, intuition and experience than to get caught up in the authority of the “experts”. If at any time something doesn’t feel right to you, pay attention, examine your own feelings, and trust in your intuition and your own basic wisdom and goodness. Non-striving: Meditation is different from all other human activity: we do it not with a goal or destination in mind, but rather with a mind towards simply being—not doing. There is no goal other than for you to be conscious of yourself as you are. Acceptance: Acceptance involves seeing things as they actually are in the present. We may not like it, but if that’s the way things are, so they are. Sooner or later we all must come to terms with things the way they are and accept them. Acceptance allows us to cease struggling to change things that are beyond our ability to control and is the first step in any genuine process of change. Only with acceptance can the mind become free.